Delve into Peru’s Sacred Valley and discover the culture, arts and cuisine of the many remarkable communities that make the valley their home. Archaeology buffs will be in their element, with plenty of ruins to explore including the World Heritage-listed Incan Site of Machu Picchu before the delights of the charming city of Cuzco are revealed to you. There’s an abundance of included activities from community visits, local market explorations and fascinating museums to exploring ancient sites across the entire journey. This itinerary is at the perfect pace to relax and explore this fascinating destination before cruising in all-inclusive luxury to the great white wilderness of Antarctica. 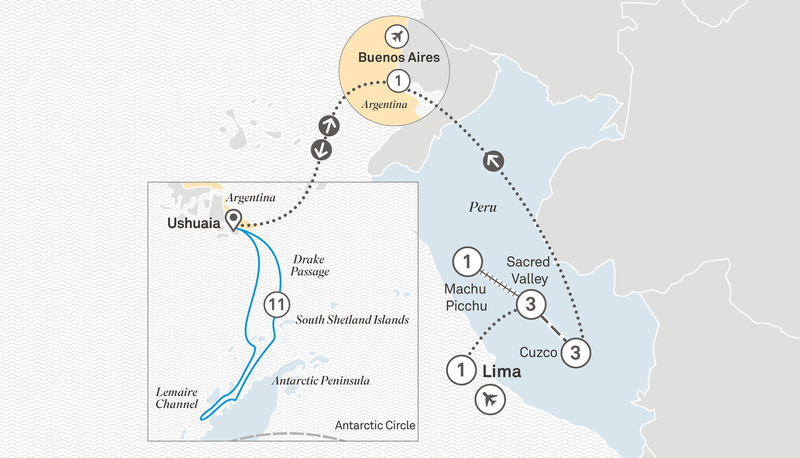 Fly to Buenos Aires for an overnight stay. Fly to Ushuaia to embark on your luxurious cruise. Settle into your handsomely appointed suite and acquaint yourself with all the sumptuous facilities of your luxurious Discovery Yacht. Toast the start of your voyage at the welcome cocktail reception hosted by the Captain who will introduce your expert Discovery Leaders and their team. Later, set sail and cruise through the Beagle Channel admiring the dramatic views of the Andean mountains of Tierra del Fuego from the comfort of your private verandah.